The Spring Equinox was yesterday, bringing us much closer to sunny jacket-free days. However, it’s still cold in Toronto and we’re bracing ourselves for a few more blustery weeks. When it’s cold, there is nothing better than cozying up at the end of the day. But we need to eat. 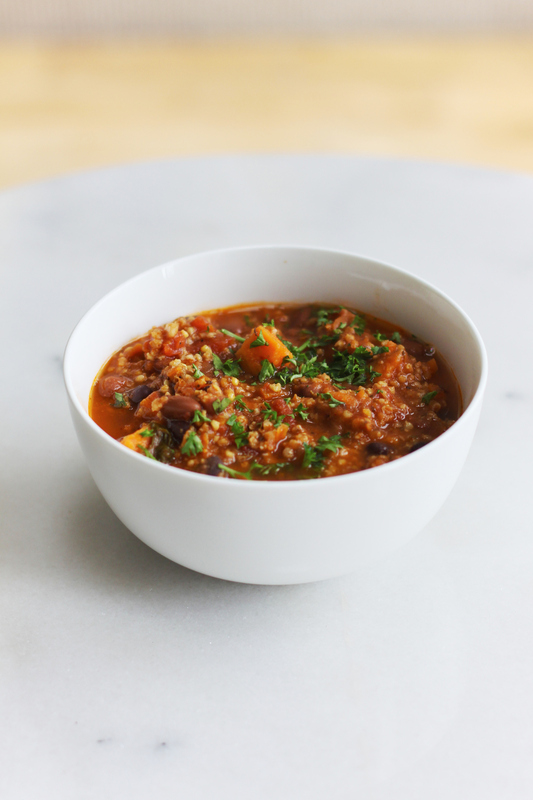 This chili is the perfect comfort food for a cold winters day to keep your body nourished and warm. It is full of healthy fats, lean proteins and complex carbs to keep you feeling full. The best part is that this recipes makes a big pot of chili, so you’ll have leftovers for lunch. 1. Soak and pre cook the dried beans (unless you are using the canned beans). until the onion is translucent, about 5 minutes. 4. Add water and quinoa and bring to a simmer, cover. is tender, about 10 minutes. returning to a simmer for another 5-7 minutes. The quinoa will be cooked at this point as well. 7. Remove from heat and stir in freshly chopped cilantro. Danielle Milgrom has always loved to cook. Eating is her passion, and she loves good food. As she got older, Danielle realized that what she was eating was not the healthiest and she was not happy when she looked in the mirror, and she developed an eating disorder. After years of anxiety and obsessing about her weight, Danielle had a “ah hah” moment. Danielle started studying Holistic Nutrition in 2015 and has learned that the right foods nourish the body. She now strives to help others heal their body and guide them through their journey by providing lifestyle counselling, developing recipes and cooking meals. Danielle studied Psychology and Social Service Work, allowing her the learn how others mind work, and the behaviours that follow. She has worked with individuals to change their behaviours, and develop plans to implement lifestyle changes.